Sunday afternoon sessions at Dance Attic, 368 North End Road, Fulham SW6 1LY. Incognito Dance is putting together a LADIES ONLY Student Performance Team. This 12-week performance course is a unique opportunity for Intermediate / Advanced Ladies to take their dancing to the next level (Improver level ladies are also welcome to join, depending on how hard they are prepared to be pushed). By working on specific techniques, body movement, styling, spinning and musicality, the aim is to improve your ability, grace, confidence and presence as a female dancer. The ladies are selected from an audition process. We are looking for 14 Intermediate / Advanced Ladies to join this group, so please apply early to avoid disappointment. Auditions are now open. The course is intensive and requires dedication and hard work in and outside of the studio. However, it is very rewarding and we have always seen our ladies grow in confidence and develope technique through this process. You will get 12 x 2-hour sessions that will prepare you for a variety of shows across London’s top and best-established salsa & bachata clubs, as well as the amazing Scottish Salsa Congress in January 2020. Rehearsals take place in mirrored dance studios in the Fulham Dance Attic on Sundays. Each lady will perform an average of 6-10 shows. Personal attention, guidance and support will be provided over the entire experience. Ninela joined the Incognito Team in May 2013 as an in-house teacher and performer, both in leader and follower roles. 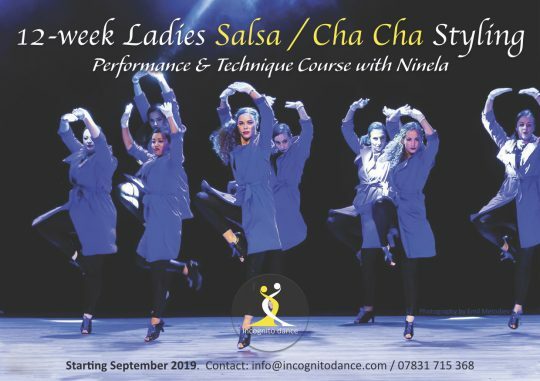 Since then, Ninela has choreographed and run 4 performance courses and regular masterclasses in salsa, mambo, cha cha, bachata, ladies styling and musicality, as well as organising our teams to perform at the amazing Bulgarian Salsa & Bachata Congress in June for the past 3 years. If you’d like to join and perform please email: info@incognitodance.com. NB: No refund on course fee.